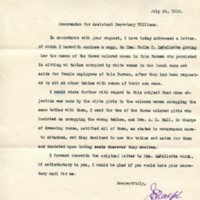 JE Ralph notifies the Assistant Secretary that he has sent the names of the three girls who violated the segregation policy at the Bureau of Engraving and Printing to Belle C. LaFollette. 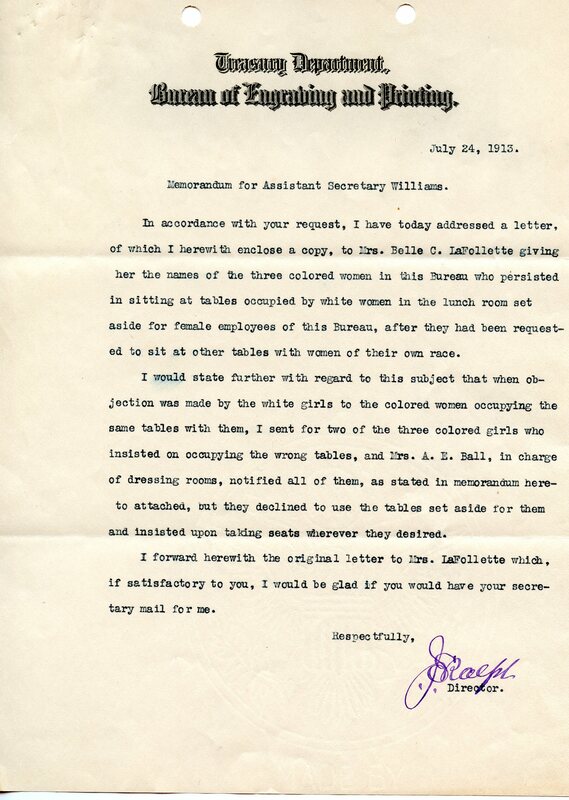 In accordance with your request, I have today addressed a letter, of which I herewith enclose a copy, to Mrs. Belle C. LaFollette giving her the names of the three colored women in this Bureau who persisted in sitting at tables occupied by white women in the lunch room set aside for female employees of this Bureau, after they had been requested to sit at other tables with women of their own race. I would state further with regard to this subject that when objection was made by the white girls to the colored women occupying the same tables with them, I sent for two of the three colored girls who insisted on occupying the wrong tables, and Mrs. A. E. Ball, in charge of dressing rooms, notified all of them, as stated in memorandum hereto attached, but they declined to use the tables set aside for them and insisted upon taking seats wherever they desired. I forward herewith the original letter to Mrs. LaFollette which, if satisfactory to you, I would be glad if you would have your secretary mail for me. Ralph, Joseph E., 1863-1922, “Memorandum to Assistant Secretary of the Treasury from JE Ralph,” 1913 July 24, SE072413d, Race and Segregation Collection, Woodrow Wilson Presidential Library & Museum, Staunton, Virginia.